Most of us are quite content to ignore our fruit plantings during the winter. At least I know I am guilty of that. Winter brings about other challenges for me — end of year reporting, conferences to attend, data to analyze, papers to write, etc. I know that everyone has their own stuff to deal with too making it difficult to keep your mind on something that isn’t growing (or at least appears that way). Of course there are a myriad of things that could be done to improve the planting, of which pruning and sanitation are some of the most important. However, I believe the most important thing to do during the time when it is too cold to get outside and you would rather bundle up in a blanket next to a warm fire is to learn. Education is a never-ending process. New things are discovered every year about fruiting crops. New pests, new varieties, new methods of management, etc. The great thing is that you no longer need to drive somewhere during sleet, snow, or icy drizzle to get to a meeting. Extension is starting to embrace online education techniques like webinars and blogs to keep clientele apprised of new discoveries. I would also encourage social media interaction. There are lots of Extension specialists and agents on Facebook, Twitter, Instagram, Snapchat, Pinterest, etc. These are all platforms to interact with us. If you don’t know how, just ask and any of us would be happy to help you learn these new things. The world is digital and not going back. If we can find common ground with our learning environments we can all be so much better informed. So, what to do during this winter? Try something new and learn, learn, learn. Ah, fall. That time of year when a respite from oppressive heat and humidity comes to south Mississippi. Fall, to me, is the best time of year. Growing up in Michigan I appreciated the great leaf color show every year. If pressed, I will admit to missing that (but not the awful dreary weather that comes with it). Most of the plant species in south Mississippi are not known for their fall color. Sure, there are some Swamp Red Maples (Acer rubrum) and Sweetgums (Liquidambar styraciflua), but most don’t have really good fall color. One primary reason for that is the lack of cold temperatures. Blueberries do have some fall color, some cultivars and species more so than others. But, let’s talk more about why fall color happens in the first place. Many blueberry leaves turn red in the fall — or so it seems. Actually the red pigments are there the whole time, it is just that the chlorophyll (green) overshadows the other colors. In the fall, these chlorophyll pigments degrade, leaving behind the red and orange colors. Chlorophyll breaks down in sunlight so the plant needs to continue synthesizing new chlorophyll to keep the green color in its leaves. The conditions that promote this are warmth and sunshine, both at their peak during summer. 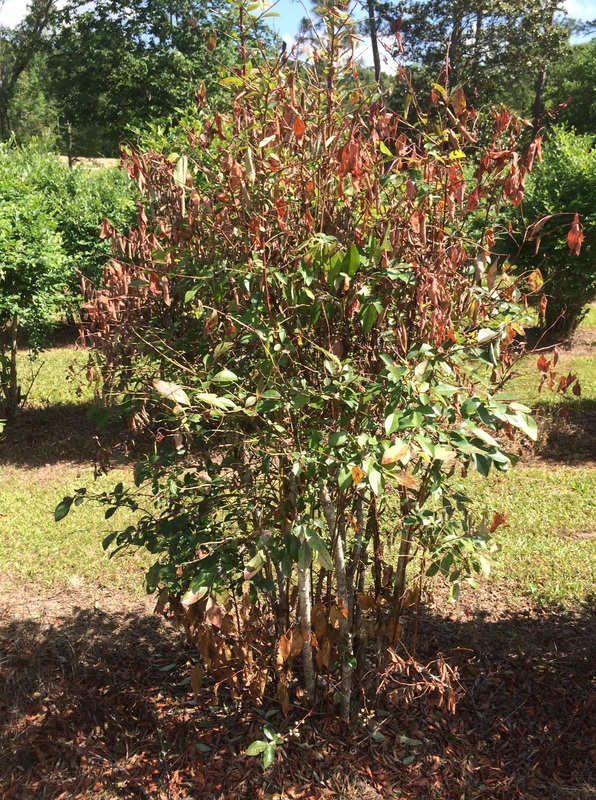 Part of the chlorophyll degradation is the plant preparing for winter — it is reallocating nutrients back to the root system. Since leaves are mainly disposable on deciduous species, it makes sense for the plant to take nutrients like Nitrogen and return it to a permanent plant structure. Once stored in the roots it can be reused in the next year. Blueberries have anthocyanins in the leaves. Once the chlorophyll is lost, the leaves appear red due to the color spectrum of light it is absorbing. This is a natural process that helps the plant maintain leaves while it reallocates nutrient reserves to the root system. 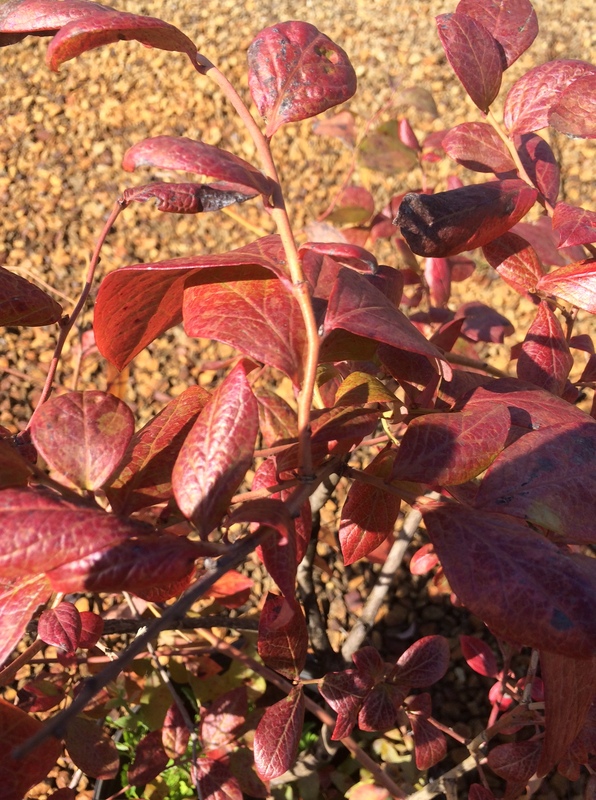 Of course there are times of the year when we don’t want to see red leaves on blueberries, especially in the spring after a frost/freeze event, but seeing red during the fall is a natural, normal thing that portends the coming winter. Great red fall color can be seen on commercial blueberry cultivars, but also native Vaccinium species like V. elliottii and V. darrowii. Below is a photo of ‘Springhigh’, a southern highbush blueberry released from the University of Florida blueberry breeding program. Many blueberry plants are still green here in south Mississippi. Many won’t turn red, or at least not completely, before falling off the bush. Some cultivars retain their leaves throughout the winter. So much variation among blueberry cultivars and species! Enjoy the fall — while it lasts. The prodigious and regular rainfall we have experienced this Spring may be good for some things, but it is not good for ripening blueberries. As you can see in the photo below, excess rainfall can cause blueberry fruit to split rendering it unsaleable and inedible. So, how does this happen? First off, water splitting happens in other fruits too. More study has been done on cherries than most other fruits. Reasons that cherries split are related to cultivar, fruit maturity, temperature of the water that hits the fruit, temperature of the fruit itself, duration of wetness, sugar content, fruit firmness, turgor pressure within the fruit, relative humidity, soil moisture, permeability of the skin and elasticity of the skin. In blueberries, studies have shown that absorbed water through the skin is one reason, but also via root system uptake (although less so than direct contact). The incidence of rain-caused splitting is very cultivar dependent and that cultivars with firmer fruit may be more susceptible to splitting. What, within the fruit itself, could lead to this? Some studies have suggested that in some cultivars the amount of air-filled spaces between cells could allow more water to enter but not split. Another stated that cells that weakly adhere to each other may split more readily. A recent study showed that there is a moderately high heritability for fruit splitting, suggesting that this trait can be improved to some degree through plant breeding. A past survey of MS and LA growers found that fruit splitting could reduce marketable yield by as much as 20% in some cultivars. This means that cultivar choice is very important to avoid this type of damage. Results from different studies mostly agree on results of what cultivars split more than others. Below I have put them into three different categories: ~10% split or less (Low); ~10-19% (Moderate); ~20+% (High). One study found that excluding rainfall from the plants (covering them) was not a sure way of eliminating split, although it did reduce it. Also, fruit on plants that are overhead irrigated appear less likely to split than those on drip irrigation. New products are now on the market that may help reduce fruit split damage. They have not been tested in Mississippi, but have been tested in Florida and Georgia with encouraging results. D. Marshall et al. 2008. Blueberry splitting tendencies as predicted by fruit firmness. HortScience 43:567-570. D. Marshall et al. 2007. Laboratory method to estimate rain-induced splitting in cultivated blueberries. HortScience 42:1551-1553. D. Marshall et al. 2009. 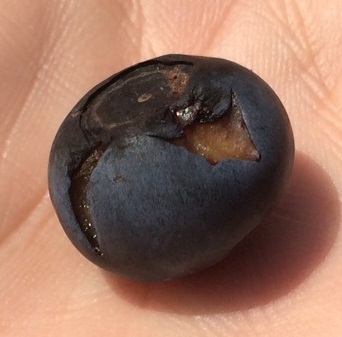 Water uptake threshold of rabbiteye blueberries and its influence on fruit splitting. HortScience 44:2035-2037. D. Marshall et al. 2006. 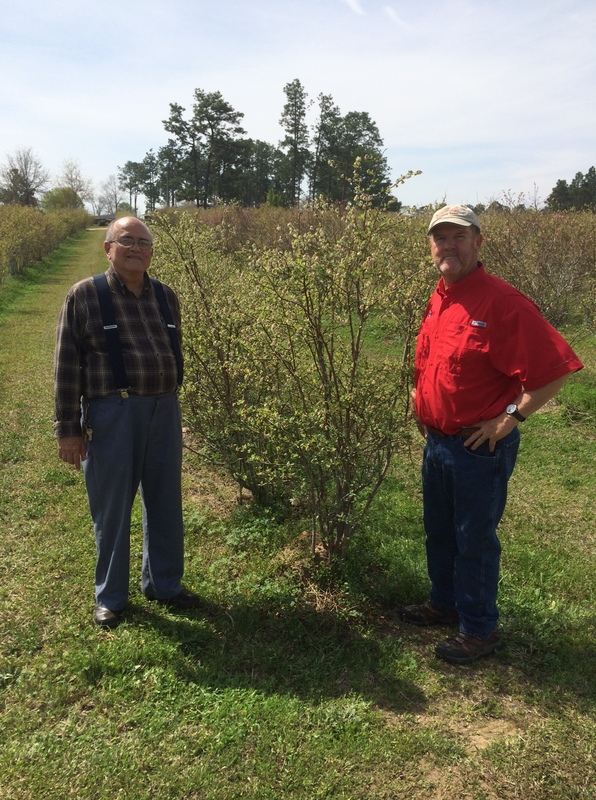 Splitting severity among rabbiteye blueberry cultivars in Mississippi and Louisiana. Intl. J. Fruit Science 6:77-81. D.S. NeSmith. 2005. Evaluation of fruit cracking in rabbiteye blueberry germplasm. Southern Region Small Fruit Consortium Research Project Progress Report. M. Dossett and C. Kempler. 2015. Heritability of fruit splitting tendency in blueberry. HortScience (in press) abstract. Glyphosate (i.e. RoundUp) has been getting a lot of bad press lately, mainly as it relates to GMOs. This post is not about GMOs, but rather prudent use of herbicides. Herbicides are great tools, but must be used with caution. First of all, the label is the law, so any instruction supplied on the side of the herbicide container is what one must follow for application (an online version of the label IS NOT considered to equivalent to the actual one on the container). Second, make sure the tanks you use are either dedicated for the type of pesticide being applied (one for herbicides, one for insecticides and/or fungicides, etc.). Third, clean out the tank, especially if you are changing products. Residue can lead to unintended consequences. Fourth, understand the mode of action and rotate chemistries to reduce the chance for weed resistance. Fifth, know which weeds you want to control and use the best product for those weeds. Sixth, timing of application is VERY important for control — knowing the weed life cycle and timing the herbicide application with the most vulnerable period will yield the best results. There are some rules to follow when using any herbicide, but since glyphosate is so ubiquitous some closer scrutiny is needed. Now, on to glyphosate specifically. It is a systemic herbicide, meaning the product is taken up by the plant and translocated within it. Glyphosate inhibits plant enzyme production, thus disruption its ability to synthesize certain amino acids. So, it is very good at killing a broad spectrum of weed species. Unfortunately, if not applied properly, it can be very good at killing fruit and nut plants too. Since RoundUp went off patent, there are many glyphosate products on the market now. Some have very different percent active ingredient. Knowing the percent active ingredient will tell one how much water to mix it with prior to application. Still, sometimes errors are made and a high price is paid. A recent visit I had to a blueberry field revealed significant damage from glyphosate application. The grower had good intentions and had used glyphosate without problem for years, he had run out of one container and switched to another new one. Several rows had no problems (application with the first container), but the next rows had significant death. Why? The amount of active ingredient was different, but the applicator mixed the same amount for application. The plants may never recover and probably need to be removed. The photo below tells the story. If in any doubt about applying herbicides properly, contact a local county Extension office for help. I only write this as a public service message. Don’t get me wrong, I am not necessarily blaming big box stores for their inventory. I don’t know how some of the varieties are chosen and how they are labeled, but the consumer must be wary when shopping at these locations. This past weekend I visited a big box store for a few items I needed. I didn’t need any fruit plants, but I decided to take a look at what was available. Needless to say, I was dismayed at the selection. Where do I begin? Available grape vine varieties: Concord, Flame Seedless, Black Monukka, Mars, Thompson Seedless. Problem: All of these are not resistant to Pierce’s Disease and will die within a couple of years at most. There were no muscadine varieties available at this location in south Mississippi. It boggles the mind. Solution: Do some serious research before buying grapes in the Deep South. Muscadines are the best option. Some bunch grapes do have potential, but are not usually very common in the nursery trade. Available blueberry varieties: Legacy, O’Neal. Problem: There is no problem with these per se, except that one was mislabeled as a rabbiteye variety (Vaccinium virgatum) and the other a wild blueberry species (Vaccinium darrowii) when they are actually southern highbush (Vaccinium spp.). I did not see any rabbiteye varieties (although I did not look at every plant). Rabbiteye varieties are the best option for a homeowner here. Solution: Southern highbush blueberries are partially self-fertile but will do better with a pollinizer. Rabbiteye varieties require planting two different varieties with overlapping bloom times. None of this information was available on the labeling at the store. Local nurseries will have a better selection. Available pecan variety: Elliot. Problem: There were two tags on the tree. One said ‘Elliot’ pecan and the other said “ungrafted seedling”, which means it is NOT Elliot, but seedling of Elliot. This is very misleading. Someone thinking they were getting an Elliot may end up disappointed. A seedling of Elliot may or may not have some of the Elliot traits that make it desirable to grow. Pecan trees also need to have two different varieties with overlapping bloom periods in order to produce nuts. In this case there was only one type available. Solution: Local nurseries may not have the best selection. The internet is your friend in this case. Most pecan trees come from AL, GA, or TX, although if you search hard enough you can find some in MS. A homeowner should choose varieties that are resistant to pecan scab. If you don’t and do not plan to control the disease, it is really a waste of your time, money, and effort. Available bramble variety: Boysenberry. Problem: Boysenberry is a hybrid raspberry x blackberry cross that originates from the west coast of the U.S. and is not especially tolerant of high heat conditions. Coupled with the high humidity and prodigious spring rainfall it is a recipe for poor plant production. It was also mislabeled as Rubus ursinus. Solution: Many blackberry varieties are available that will grow and produce in the Deep South. Raspberries fair less well because they too do not tolerate the heat as well as blackberries. I have seen blackberry varieties available at local nurseries recently, namely Kiowa, Apache, and Brazos (!). These are far better options than Boysenberry in our area, although the thorny types will have problems with rosette (double blossom) fungus. There were probably other fruiting plants that I didn’t look at too closely at to see if there were problems with them as well. The real lesson here is this: Know what you are looking for and why. Realize that all blueberries or grapes or pecan are not created equal. Some do well here and some do not. Mislabeling is not a new thing in the nursery trade, but seeing the grievous errors in these examples made me cringe. Before buying at the big box store near you, educate yourself on the crop you wish to purchase, talk to the folks in the garden center, and if you are not satisfied go somewhere else. Contact your local county Extension office for more information on fruit crops for your area. Or feel free to contact me. I can help. 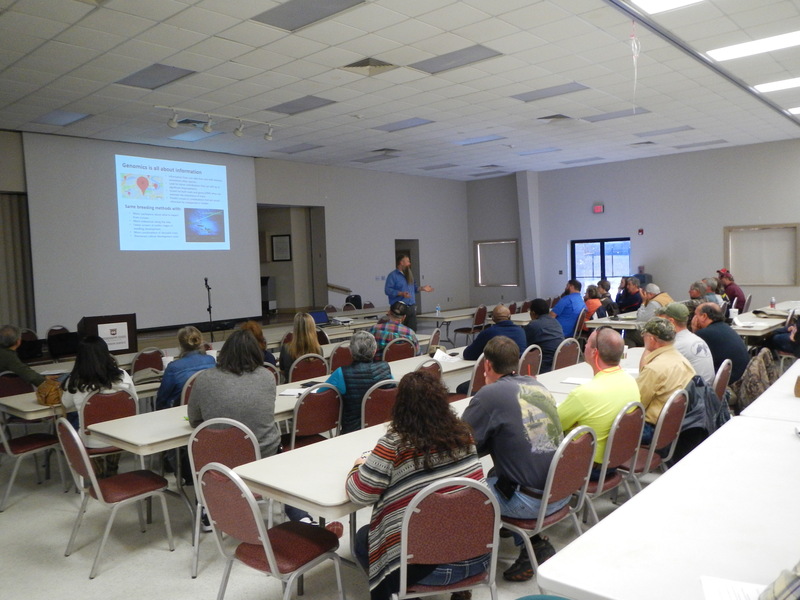 Last week, Dr. Scott NeSmith, blueberry breeder from the University of Georgia, came to Poplarville for a visit. 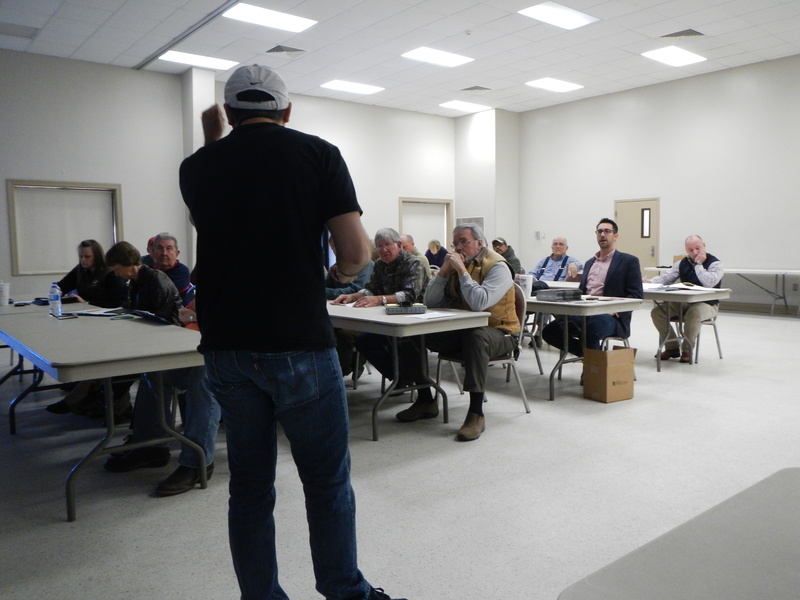 We talked about the current state of the Mississippi blueberry industry (as well as what is happening in Georgia). He stated that some early blooms may have got nipped some from cold events in the last few weeks there, but he was unsure how much loss to attribute to it. He was really interested in the cultivars currently being grown in Mississippi, so we headed on over to visit Luis Monterde. At his farm we saw most of the bushes in full bloom, with scads of pollinators buzzing from bush to bush. Dr. NeSmith asked if he had any Georgia releases. Luis said yes (Alapaha and Vernon) and showed them to us. Luis was high on Alapaha but expressed some reservations on Vernon. Dr. NeSmith said that in Georgia, high fertility was to the detriment of Vernon, which preferred low fertility management. He also suggested that the new cultivars Titan and Krewer might be good options here in Mississippi. As plants have been difficult to get, not much of it is planted here yet, so only time will tell on that. He did say they would split in the rain (Titan more so than Krewer). The issue of growing southern highbush blueberries also arose in our conversation. Luis said he has mostly given up on them (although he had one row), as they were difficult to keep alive for very long. One suggestion Dr. NeSmith had was to try Camellia and/or Suziblue. He believes they are “tougher” plants and can stand up better than other cultivars that have been tried in the past. Luis asked him what Georgia growers were doing with Premier, and Dr. NeSmith responded “pulling it out” due to the unreliable yields. After about 1.5 hours, we bid Luis goodbye and I took Dr. NeSmith back to Wiggins where he was staying. He doesn’t make it over here very often, so it was good to be able to spend some time with him and pick his brain about new potential cultivars for Mississippi.